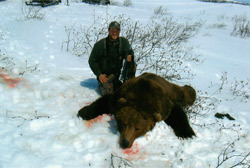 Alaska Brown Bear Hunting at it’s Best! 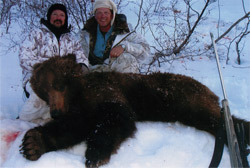 Now Booking Spring Bear Hunts. 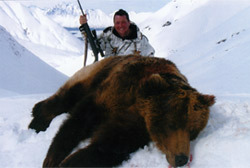 JD’s Kniktuk Outfitters specializes in Alaska Brown Bear hunting. We are located approximately 300 miles west of Anchorage, Alaska, based out of Dillingham. 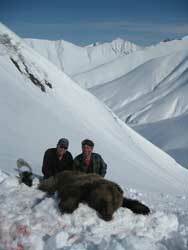 The region is well known for its number and size of bears. Your hunt will be done by snowmobile, airplane, and snowshoe. The month of April is our key time as the bears are coming out of hibernation. You will stay in a cabin or tent camp depending on where the bears are spotted. 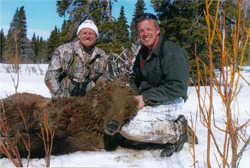 Includes all food, accommodations in field, trophy prep, guides. 9' 9' 4" 10' 6" fall 9' 4"
Our success rate over the past five years is 85% and our price structure is the most fair in Alaska.